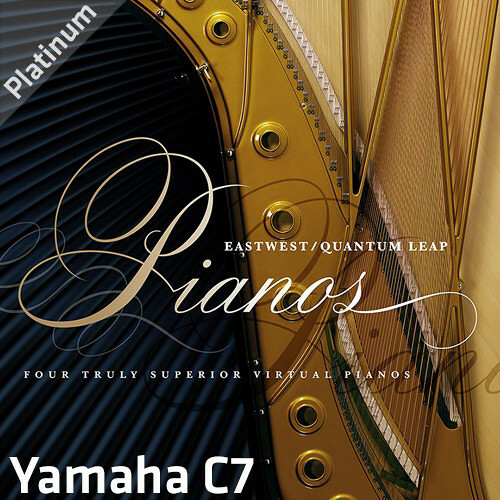 Available for download, the EastWest Quantum Leap Pianos Yamaha C7 Platinum is a virtual piano that offers a bright tone perfect for rock and pop. This particular piano was utilized on a wide swath of famous pop and rock records. This library distinguishes itself not only by its brilliant, clear timbre, but also by the attention paid to sampling the software dynamics of the instrument. This 47GB library has been painstakingly captured with multiple mic positions and with sampling techniques that secure an authentic sound. For instance, piano repetition samples have been recorded in real-time from 180 BPM performances, so when you go for a repetition, you'll hear a recording of the real thing—not a retriggered, alternate sample. Sympathetic pedal resonances have also been recorded for every note at many different velocities. Samples are triggered and played through the accompanying PLAY software, a 64-bit audio engine that powers the EastWest Quantum library. This software is compatible with Mac and Windows platforms, and operates in AU, AAX, and VST formats. yama master: A master patch that includes sustain, sustain with pedal, repetitions, repetitions with pedal, soft pedal sustain, soft pedal sustain with pedal, and staccato on the mod wheel. yama sus rep: This patch includes sustain, sustain with pedal, repetitions, and repetitions with pedal. yama sus: This patch includes sustain and sustain with pedal. yama master lite: A reduced memory version of the Master patch that includes sustain, sustain with pedal, repetitions, repetitions with pedal, soft pedal sustain, soft pedal sustain with pedal, and staccato on the mod wheel. This is a light memory version. yama sus lite: This patch includes sustain and sustain with pedal in a light-memory version. yama sus rep lite: This patch includes sustain, sustain with pedal, repetitions, and repetitions with pedal, all in a light memory version.